8.6 Our Score Overall the Gtech Multi Mk2 does what it says on the tin. It’s a great helper for all types of people whether you own a house or an apartment, though is especially great for busy parents. What Is the Gtech Multi Handheld? Gtech, otherwise known as Grey Technology, is a company incredibly dedicated to researching and developing cordless appliances – including cordless garden tools and electric bikes. With a wide range of battery powered vacuum cleaners and sweepers (read our Gtech AirRam 2 review here), it’s no surprise that they also offer a powerful and versatile handheld. The Gtech Multi Mk2 cordless handheld is a cleverly designed hoover that can be used for cleaning everything from your car upholstery to the mirrors hanging on your wall at home. It’s a step up from the Mk1 in that it’s 30% more powerful, now comes with a motorized brush head to better clean your furniture and stairs, and more attachments right out of the box. It’s a serious piece of kit and the price demonstrates this fact as it targets the higher end of the handheld vacuum cleaner market. We’ve bought one to see if it’s the last handheld you’ll ever need, or whether you’ll wish you hadn’t broken the bank. Read our Gtech Multi Mk2 review to find out. Innovative – Cleverly designed cordless handheld with onboard attachments and a 40cm extendable built-in hose. It also has two LED’s that light up your cleaning area. Lightweight – Not too heavy at 1.6kg considering the possible applications. Runtime – The 22V battery provides up to 20 minutes of cordless hoovering. Easy to Empty – The removable dirt receptacle is easy to empty without getting dust on your hands. Charge Time – Takes up to 4 hours to charge fully, although this is fairly standard across most cordless models. Bulky – The design, although ergonomic, makes it a little bulky for certain types of cleaning (i.e. around the car). On-Board Attachments – The Gtech Multi Mk2 is designed to be practical while cleaning. Aside from an extendable 40cm hose to use when needed, stored within the body of the unit is a crevice tool and dusting brush. Power Brush Head – The motorized brush head now makes it more practical for cleaning stairs, as well as removing pet hair from carpet and upholstery. 36cm Extension Tube – Although this was also available for the Mk1, the extension tube is now included in the box rather than having to order it separately. With the additional reach, the Mk2 has respectable floor to ceiling cleaning abilities. It’s also easier to get into nooks and crannies. 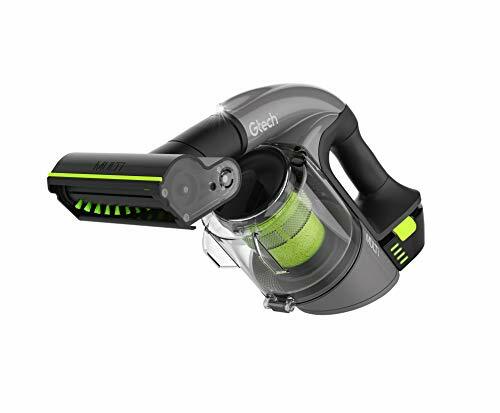 The Gtech Multi uses a professional 22V lithium-ion battery that allows the cordless hoover to produce 140 air watts for up to 20 minutes. It takes approximately 4 hours to fully recharge the battery, although if you need it for a short spell an hour of charging is enough to give you a few extra minutes. The Multi Mk2 doesn’t come with a charging dock (rather a normal plug-in charger), although you can choose to remove the battery while charging so it takes up less space. Above the handle of the machine is a four-stage green LED indicator to show you how much battery life is remaining, and also indicates when it’s fully charged. Upon unboxing you’ll notice right away that the Multi Mk2 has been carefully designed with quality materials. It’s modernistic in terms of styling and is available only in a mixture of grey and black with green accenting. The green is a trademark element found on all of Gtech’s products and speaks for their commitment to cordless innovation. The rubber handle has been ergonomically designed to fit into your hand comfortably, and the power button is within thumb reach. While some may have preferred the trigger design on the Mk1, the on/off button will mean less fatigue and is one of the selling points over the original. The Multi also features two LED lights on each side that light up your cleaning area which will come in handy more often than you think. The base of the unit stores the crevice and upholstery tools and the flexible hose can be extended 40cm by slightly twisting and pulling the end of the main nozzle. Aside from these features, included is a 36cm hard plastic extension tube with dusting brush which you can attach the crevice tool to and a motorized brush head. To use the motorized brush head you have to remove the main nozzle, although it fits into place with a firm click which speaks for the build quality. It’s possible to also remove the brush from the side of the head when you need to clean it. The clear dirt receptacle and filter can simply be pulled away from the main unit (no latch) when you want to empty it and replaced in reverse order. The dirt receptacle has a door at the bottom which flips open and allows you to empty the dirt and debris, while the sponge filter can be removed from the top of the receptacle to be cleaned under running water. Make sure that after cleaning the filter you allow it to dry completely before reinstalling. The Multi Mk2 is very easy to use and performs brilliantly around the home. If some of the attachments are daunting the included instruction guide explains everything in simple fashion. The machine head is particularly good for dirty carpeting and does an above average job at picking up animal hair compared to other handhelds. Note that Gtech does make a K9 version of the Multi for people with excessive animal hair to clean up. It has no problems picking up various materials, whether you’re cleaning up spilt food from the kitchen floor, rice Krispies from your dining table, kitty litter around the cat box or debris from your welcome rug. Both the flexible hose and the hard plastic extension makes it possible to clean under furniture, and to use it as a duster around the home. The unit doesn’t feel too heavy, but people cleaning around the home for the full charge might start to notice the weight. It’s a little bulky to use in the car and the attachments are limited (the motorized brush being the most useful). However, it’s possible to purchase a car accessory kit on Amazon to get around this problem. If you will be cleaning your car often with this hoover it’s best to keep on top of it so it doesn’t get too dirty between cleans. As mentioned, the Multi Mk2 is priced towards the higher end of the market at just under £150, with perhaps the Dyson being the only company to sell a more expensive handheld only unit. However, you definitely get what you pay for as it’s a well-made vacuum with a 2-year warranty. It’s also possible to purchase more comprehensive or longer cover via Amazon. Overall the Gtech Multi Mk2 does what it says on the tin. It’s a great helper for all types of people whether you own a house or an apartment, though is especially great for busy parents. It is larger than other handheld vacuums, but it’s designed to be more versatile too. You’ll have to decide what you will use it for and if the price can be justified but we think it’s a good buy. Is the Gtech Multi Mk2 heavy to use? It’s quite a lightweight and manageable machine for most people. However, what might be light for one person may feel slightly heavier for another. Can you use it while it’s charging? No, it can’t be used while plugged into the charger. The lead is a little short so it wouldn’t be practical anyway. Is this good for removing pet hair from furniture and the car? The Mk2 doesn’t have a problem picking up hair, especially when using the motorized roller brush. However, there is a K9 version if you have multiple pets or pets that shed a lot of hair. Is the Multi Mk2 noisy? At around 68db it’s fairly noisy, but not enough to be obtrusive. Can I detach the battery for charging? Yes, although you won’t be able to see the battery charge indicator.